NATIONAL BESTSELLERBeing a teenager has never been easy, but in recent years, with the rise of the Internet and social media, it has become exponentially more challenging. 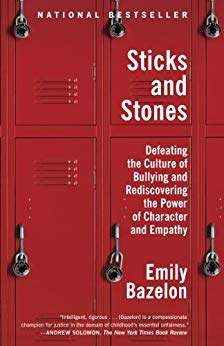 Bullying, once thought of as the province of queen bees and goons, has taken on new, complex, and insidious forms, as parents and educators know all too well.No writer is better poised to explore this territory than Emily Bazelon, who has established herself as a leading voice on the social and legal aspects of teenage drama. In Sticks and Stones, she brings readers on a deeply researched, clear-eyed journey into the ever-shifting landscape of teenage meanness and its sometimes devastating consequences. The result is an indispensable book that takes us from school cafeterias to courtrooms to the offices of Facebook, the website where so much teenage life, good and bad, now unfolds.Along the way, Bazelon defines what bullying is and, just as important, what it is not. She explores when intervention is essential and when kids should be given the freedom to fend for themselves. She also dispels persistent myths: that girls bully more than boys, that online and in-person bullying are entirely distinct, that bullying is a common cause of suicide, and that harsh criminal penalties are an effective deterrent. Above all, she believes that to deal with the problem, we must first understand it.Blending keen journalistic and narrative skills, Bazelon explores different facets of bullying through the stories of three young people who found themselves caught in the thick of it. Thirteen-year-old Monique endured months of harassment and exclusion before her mother finally pulled her out of school. Jacob was threatened and physically attacked over his sexuality in eighth grade—and then sued to protect himself and change the culture of his school. Flannery was one of six teens who faced criminal charges after a fellow student’s suicide was blamed on bullying and made international headlines. With grace and authority, Bazelon chronicles how these kids’ predicaments escalated, to no one’s benefit, into community-wide wars. Cutting through the noise, misinformation, and sensationalism, she takes us into schools that have succeeded in reducing bullying and examines their successful strategies. The result is a groundbreaking book that will help parents, educators, and teens themselves better understand what kids are going through today and what can be done to help them through it.Contains a new discussion guide for classroom use and book groups.